My wife is not a fan of long historical attractions (Museums, and Long historic tours). So we decided to try out this since it was only 1.5 hours and... she and I loved it! I am more of the historian in the marriage so I got my fix and she didn't get board. :) So it was a win win! However the reason for the 4 rating was because the customer service experience leading up to the tour was unfortunately less than desirable. The person I was in contact with directly from the company was short, and curt but brash in their text response. Other than the customer service experience before the tour... The experience was delightful and our tour guide "James" was knowledgeable and pleasant. He made conversation throughout the tour and really tried to include people and answered every question that came his way. Also, he helped us (my wife and I) after the tour with finding a local food joint to eat at and getting little more acquainted with Savannah's layout and its local attractions. So all in all the tour was a great experience and would do it again! With the massive heat wave going through Savannah, Kelsey Beth managed to keep us in the shade whenever possible. She loved answering all the questions from our GS troop. She was a wealth of knowledge! Kelsey Beth was extremely informative and passionate about the cities history. We loved learning about all of the people that gave this city its past and present. She even went out of the way to show us some things that weren’t on the tour that we wanted to learn about. Thank you KB for a wonderful morning! Jackie was very knowledgeable and provided a historical context for the 'squares that make Savannah famous. She also recommended places to which we could return. In our case it was the The Green-Meldrim House beside Madison Square. We were able to return a second day and have our bearings plus follow up another recommendation - the historic homes on Ogelthorpe. Wonderful tour with an excellent guide. Learned so much history. Would definitely do this again. Good tour but we had trouble finding the starting place so missed part of the tour. The owner did the tour and made a number of negative comments about northerners and the previous president of the US. Totally unnecessary and ruined his otherwise fine tour. We really enjoyed this walking tour! Our guide was very knowledgeable about the history of the area. Highly recommend this tour. It was a good tour. We made our reservation late so we did not have much to choose from. I wish we had done a tour that went into some of the houses. I was surprised, the guide talked a lot about the civil war but nothing about the slaves. I would guess the slaves had a major role in building Savannah, in its economy, and in it's history. At least Charleston tours will mention the slave market and their contributions to the city. It was maybe a 2 mile walk. We saw a lot of squares and what was significant of each one. It was a lot better than the ghost tour we did later that evening. The ghost tour was a waste of time. OUR GUIDE WAS EXCELLENT! EVEN THOUGH OUR TOUR WAS NOT SUPPOSED TO ENCOMPASS THE FOUNTAIN HE TOOK US UP THERE SINCE ALL OF US WANTED PICTURES. HE WAS VERY INFORMATIVE AND HAD AN EXCELLENT GRASP OF THE HISTORY AND POINTED OUT SEVERAL SIGNIFICANT FACTS AS WELL AS A FEW GHOST STORY REFERENCES THAT WERE ALSO VERY INTERESTING. HE DIDN'T SEEM TO MIND THAT HE WENT OVER THE ACTUAL TOUR TIME AND CUT IN TO HIS LUNCH HOUR. OVERALL, A VERY INTERESTING EXPERIENCE. 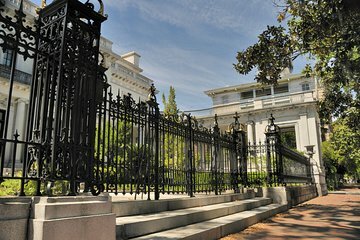 Highly recommend starting your time in Savannah with this walking tour. Our guide was thorough in explaining significance, history and folklore we saw on the tour. He offered much information to help us make the best use of our time while in Savannah.